To continue making 2016 your best year yet and bring all of your goals to fruition, the team here at ProOpinion have gone ahead and started reaching out to leading influencers and professionals who have demonstrated the power and determination in achieving their goals. Question - Before we dive into asking you about personal skill development, will you share some of your background so readers know why you’re an authority on this subject? I emerged from college with a degree in music. It was the culmination of years of practice and discipline, and an accomplishment I’m proud of. But--when my husband and I moved to New York City so he could pursue a PhD, and I became our breadwinner, it was immediately obvious that I needed more ‘practical’ skills and a different career path. My first step on that path was as a secretary at Smith Barney. I found working on Wall Street exciting; started taking business courses at night and, with the help of a supportive boss, was able to make a huge disruptive leap to investment banking. Eventually I jumped to become an equity research analyst, before leaving Wall Street and co-founding the investment firm Rose Park Advisors with Harvard Business professor Clayton Christensen. Now I’ve disrupted again, to become an entrepreneur. Question - Why is professional development and constantly developing your skills on a professional or personal level so important? Perhaps the most fundamental reason is that our world, and its job market, are constantly evolving, more rapidly than ever before. We either change with it, or even a little ahead of it, if possible, or we risk being rendered irrelevant, unable to chart our own path. But there are more fun reasons as well: brain science demonstrates that we are happier when we are learning, the potential rewards--career advancement, financial, personal--are enhanced by embracing innovative change; we can be inspiring role models for our peers and our children. It’s a course that helps us reap more of the advantages for which we are working in the first place. Question - What is the definition of a ‘disruptive strength’ and what do you consider the common disruptive strengths of top companies to be? Disruptive strengths are those that enable businesses or individuals to scale successive curves of change and innovation; for example, the ability to identify unmet needs and formulate a product or service that can fill the void. Top companies do this, and then do it again, and again. Become complacent, and they are likely to be overtaken by low-end disruptors acting with greater urgency. They recognize the advantages of eschewing competitive risk--the bruising head-to-head combat in highly lucrative but also competitively clogged sectors--to embrace the counter-intuitive but ultimately more rewarding market-risk of venturing into areas where others hesitate to play. They embrace limitations, and even deliberately impose them strategically, to encourage resourceful and creative endeavor. I like to emphasize that these disruptive strengths are different than distinctive strength(s): those being the singular abilities that make an individual or company a standout among all those who are attempting to do similar things. Identifying your distinctive strengths is essential to effective deployment of disruptive strengths. Question - You’ve mentioned on your most recent interview with Brian Solis about naming 2016 ‘The Year of the Disruptor.’ Can you briefly explain why? Two major forces are converging. First, long-time players in the business world are failing. By sticking to formulas that made them successful for decades, companies like Sears appear poised to simply disappear. Realization that companies have to disrupt, have to be innovative, and have to constantly adapt to a changing landscape, and really, should be driving the changes, is hitting home as never before. Disruption is not optional. Anyone who hasn’t recognized that already, needs to do so now, in 2016! Second, the worker bees of the millennial generation have different career expectations than those who came before them. They are looking for opportunities to innovate, to create, and to bring their dreams to work. They want to work for enterprises that share that vision. Enterprises that don’t will be overlooked by the talented game-changers who will determine where and how we do business in the future. 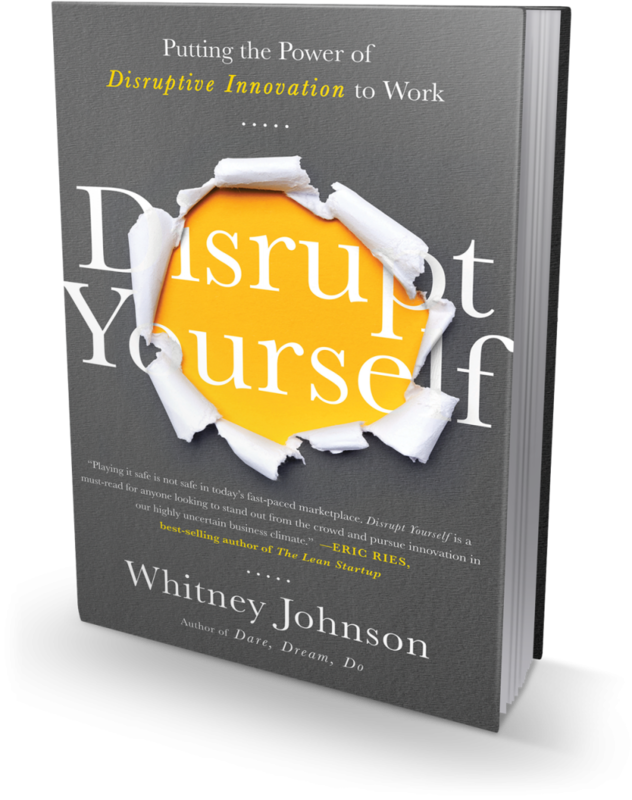 Question - Even if you’re a self-starter or a manager who is looking to bring innovation to a company (and know the specifics to achieving this), how do you or can you personally disrupt yourself when self sabotage or fear can come into play? The first step is to acknowledge that you’re afraid. The second is to recognize you’re not alone. Disruption is risky; it just isn’t as risky as sticking to the status quo! And the potential advantages are exponentially greater. Nevertheless, many people, maybe even a majority of us are naturally inclined to a self-protective, conservative approach to career--playing it safe. What we have to understand is that safety is an illusion; in today’s business climate stasis can result in career stagnation or decline. Combat fear with knowledge of where the greatest danger lies. Question - How can people develop the positive disruptive habits using S-curve waves (as outlined in your book)? What are your disruptive strengths? Who do you look up to as inspiration for developing more disruptive strengths that others don’t generally have? I am good at spotting momentum, and naming people’s strengths. I am inspired by many, many individuals. Some examples include Barbara Corcoran, who made a fortune in New York City real estate by playing where others weren’t. Susan Cain, author of Quiet, for identifying that introversion can be a distinctive strength, hers and many others. Dr. Seuss who reinvented children’s literature by embracing the constraint of a 225 word limit. Brad Stevens’ S-Curve to his current position as head coach of the Boston Celtics is a superb example of battling entitlement and being willing to step back to grow. And so on; there are great examples of successful disruptors all around us. Question - Are there any circumstances when you’d recommend not prioritising on your disruptive strengths first? No. But be aware that most people don’t lead with these because we tend to overvalue what we aren’t, and undervalue what we are. It tends to be a necessity or desperation that drives us to our disruptive / distinctive strengths. Question - Do you need goals, a new year's resolutions or plan first to start developing your own disruptive strengths? No. But here are some tips for figuring out what they are. Think about situations that have challenged you: is there a common thread among all of them? If so, that’s something that you’re good at. What do you do that makes you feel strong? What do you choose to do when you want to feel more in control? What made you stand out as a child? Don’t dismiss this, even if it made you stand out in a peculiar way. This may be your superpower. What sorts of compliments do you ignore? This might be because you do something so well that you’ve come to regard it as unremarkable. Or you might find yourself annoyed with the ‘slowness’ of others in certain areas, because you’re naturally gifted. Question: Any additional words of wisdom you’d like to offer?